1. Can we talk about this privately? Set aside a time for a private, respectful meeting with your friend to discuss your concerns openly and honestly in a caring, supportive way. Make sure you will be some place away from distractions, and try to ensure it’s as “safe” and comfortable of a spot as possible. 2. It seems like you’re eating less and less. 3. If you’re not up for it, we can do this another time. Effective conversations are never coerced. Let your loved one open up about their struggle when they’re ready. You can voice your concern privately at any time, but don’t force them to open up to you unwillingly. 4. I get really worried about you when I see you skipping meals. 5. How are you feeling? Encourage them to express how they feel; remember, it is important to understand how they feel, rather than just stating how you feel. This approach allows your loved one, assuming they’re ready, to be as open as their comfort level allows, since this topic typically produces more than just a one or two-word answer. 6. I really enjoyed this ( book | program | counselor ). I can get you the information if you’d like. Offering information in a non-threatening manner can be extremely helpful for someone who’s struggling with an eating disorder. An unfortunate, frequent side effect of the condition is the feeling of hopelessness and/or alienation, so showing your friend that they’re not alone– and that there is a treasure trove of free resources available on the internet, can be crucial to their mental state and can potentially motivate them to seek appropriate treatment. Here is a list of ten of my favorite books for better understanding mental health, and here is a link to a handful of my favorite online resources. 7. It seems like when you get really stressed, you stop eating. What’s causing you to feel so stressed? Focus on what’s going on with your friend emotionally. He or she is more than an eating disorder, which is why “How are you feeling?” is also on this list. The illness is spawned from somewhere, so asking questions about their feelings (anxiety, sadness, short temper, etc.) can provoke an insightful answer for you and for them. 8. This stays between us. Make the person feel comfortable and let them know it is safe to talk to you. Remember that eating disorders don’t respond to threats, pleas, or your poorly-researched medical advice. Never, under any circumstances, threaten to tell their parents, boyfriend, etc., unless your endgame is to end the honest conversation completely. 9. I’m not here to judge you. Listen respectfully to what your loved one has to say, and let them know that you won’t judge or criticize them for their feelings. Remember, you don’t need a degree in Psychology or a doctorate in Psychiatry to be a good listener. For the longest time, I would only open up to my counselor, since I knew it was her job to not judge me; unfortunately, for many, counseling is too pricey of an outlet. If they haven’t yet been able to find a therapist with an affordable, sliding scale pricing system, you can become the safe, open space your friend feels comfortable in during the interim. 10. Maybe you should talk to someone about the things that are stressing you out. Encourage your friend to get professional help without forcing or threatening them; simply mention it as a viable option. If you’ve been in counseling yourself, share your positive experience, even if they don’t ask! 11. I’ll come with you to your first few appointments if you’d like. Ask your friend to explore these concerns with a counselor, doctor, nutritionist, or other health professional who is knowledgeable about eating disorders. If you feel comfortable doing so, offer to help your friend make an appointment or accompany your friend on their first visit. 12. I know professional treatment can be expensive, and I’d be happy to help you apply for grants and scholarships. Speaking from personal experience, a major drawback to seeking professional treatment is the cost. Very few programs are covered by insurance, and money is a powerful deterrent to committing to regular programs of any frequency. Luckily, according to the Elisa Project, there are a handful of the free or low-cost treatment options available, including government-based research programs, Psychiatry departments at teaching universities, school counseling departments, and community mental health centers. Additionally, there are scholarships available for those who qualify, and you can easily help someone apply for assistance from Project HEAL, The Kirsten Haglund Foundation, Manna Fund, Moonshadow’s Spirit, and The Emily Program. For more information on finding and funding eating disorder treatment, click here. 13. Is there anything else I can do? Always offer your support whenever possible. Let your friend or loved one know that you’ll be with them every step of the way. Approaching recovery alone is intimidating and, from experience, nearly impossible, so nip your friend’s fear of tackling the eating disorder by themselves in the bud. 14. I love you, and I’m here for you. Express your continued support at any and every opportunity. Remind your loved one that you care about them unconditionally and want them to be healthy, happy, and living life to its fullest potential. You wouldn’t be reading this post if your intentions were anything different. Happy Monday! I hope this helps any of y’all who want to help someone with an eating disorder but are unsure how to go about it. If you have any questions, feel free to leave it in the comments or reach out ot me by email at stephanie.ziajka@yahoo.com. Cheers to a fabulously healthy week– and to a Leap Year! 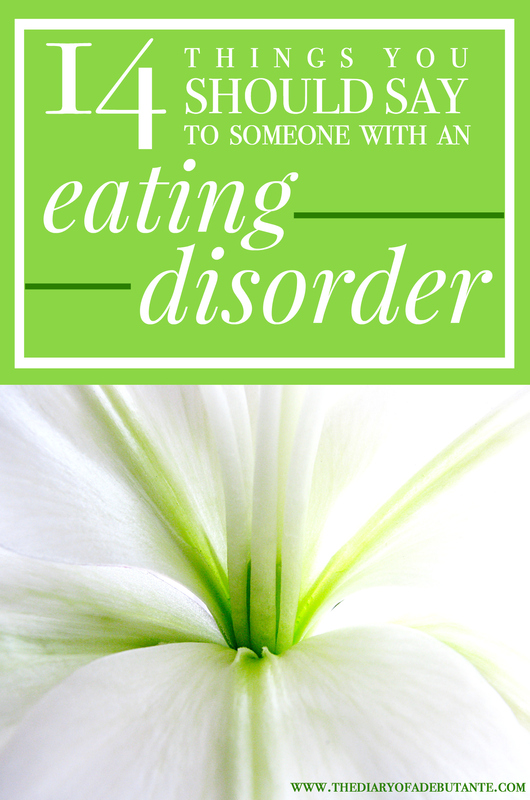 It’s great to know about residential eating disorders. My daughter has been struggling with this, so she needs help. I like how you said that effective discussions aren’t coerced. I’ll remember this when I try and talk to her. Hi Stephanie, I really appreciate the way you have shown how people should tackle or deal with their friends or loved ones suffering from eating disorders. My younger sister is also suffering this disease. She suffers a Binge Eating Disorder and goes crazy when anything happens around or with her. She feels that her moods are dependent on what she eats. Her parents have consulted the concerned experts. Thanks for sharing this.